On January 16, 2014 Transit Police officers working in Area 4 received a report from a female party who stated at approximately 6:15 pm (same date) while waiting for a Green Line train at Hynes MBTA Station she observed a male, standing on the inbound platform, exposing himself and committing a lewd act. The reporting party went on to furnish a physical description and other identifiers of the offender. 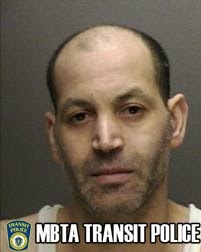 Subsequent to an investigation conducted by Transit Police detectives Salah Koutaiby, 49 of East Boston was arrested at Hynes MBTA Station on January 28, 2014 for Open & Gross Lewdness. It is expected Koutaiby will be arraigned sometime today in Boston Municipal Court-Central Division. The Transit Police believe that incidents such as described above are under reported crimes. We encourage all who may have witnessed and/or been victimized by such incidents to please contact us. We will vigorously investigate all reports and ensure those individuals who commit such acts are held accountable.